July 27, 2015 (Steamboat Springs, Colo.) – Big Agnes®, a leading manufacturer of sleeping bags, pads, tents, insulated apparel and distributor of Helinox® camp furniture in North America, has teamed up with Goal Zero® on a line of Solar Ready™ tents. This partnership follows a successful multi-category product collaboration with Burton Snowboards which debuted this year. “From backpacks to kayaks to tents, we’re collaborating with brands our customers already know and products they’re already in love with, so Big Agnes is an obvious fit,” says James Atkin, Goal Zero’s director of brand marketing and Solar Ready partnerships. “Solar Ready unlocks the ability for brands to work directly with us to create a seamless integration between their products and the power their customers are craving to truly enhance any off-grid expereince." Big Agnes will introduce the lightweight Krumholtz UL2 mtnGLO™ and Red Canyon 4 mtnGLO at Outdoor Retailer Summer Market 2015. The tents keep gadgets powered in the backcountry with a Goal Zero Nomad® 7 Solar Panel and Flip 20 Recharger. 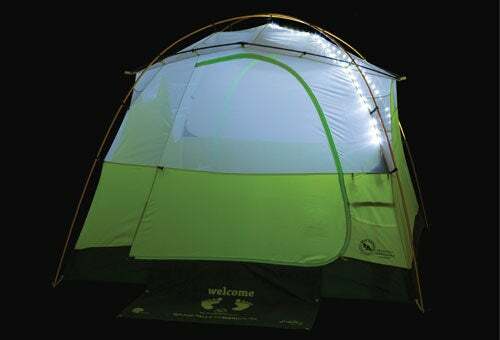 The line features an integrated weatherproof cord routing system that allows the solar panel to power electronics inside the tent while keeping out the elements. The Krumholtz and Red Canyon feature a customized Goal Zero Fan and Light-A-Life Mini Lantern, media pockets for electronic device storage and cord routing for headphones. The Solar Ready tents will be on display at Outdoor Retailer Summer Market 2015 in Salt Lake City in August. For more information, please contact carl.johnson@backbonemedia.net or stop by the Big Agnes booth #10045.